Mold spores multiply rapidly. It's important to act swiftly if you suspect the presence of mold in your home. In addition to cleaning area homes, Viviane's Cleaning & Restoration Inc has been providing professional mold removal services since 2002. Mold exposure has the potential to create adverse health effects and symptoms which range from allergic reactions, asthma, respiratory problems to skin, eye, nose, and throat irritations. If you require mold removal, call the pros at (781) 222-3182 today. Viviane's Cleaning & Restoration Inc removes mold thoroughly and permanently and then cleans and sanitizes all affected surfaces. If your walls or ceiling require touch up painting, we can help with that as well. 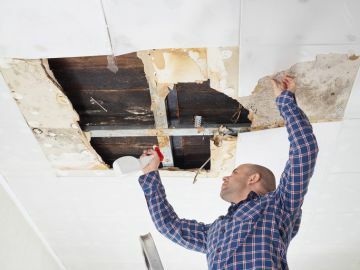 Viviane's Cleaning & Restoration Inc's experts don't just remove mold in your home, we repair your ceilings, walls and flooring as required to restore your property to its previous condition. If you require removal of mold in your home, call 781-222-3182 for a quick estimate. Mold Inspection: Our process begins with a thorough visual inspection. We will assess the types and quantities of mold and examine sources. From there, you will receive a written estimate and plan for removal of mold and reconstruction of affected areas. *This charge is separate from any further services. Remediation total will be discounted if inspection costs do occur. Mold and Mildew Removal: Once mold is found, we take corrective action removing the mold and mildew from your home quickly and safely. Viviane's Cleaning & Restoration Inc's mold removal pros are experienced in proper cleanup of mold spores using appropriate industry standard methods. Property Repair & Refinishing: The final step in our mold removal process is to repair and restore your property to "like-new" condition. Viviane's Cleaning & Restoration Inc will repair damaged flooring, repair drywall and ceilings and paint the affected areas. All unpleasant odors and staining will be eliminated. Why Call Viviane's Cleaning & Restoration Inc for Mold Remediation? From initial detection to the final coat of paint, Viviane's Cleaning & Restoration Inc will be with you every step of the way. For 17 years, Viviane's Cleaning & Restoration Inc has excelled in restoring indoor air quality by safely removing mold and mildew . For a healthy, safe environment, contact Viviane's Cleaning & Restoration Inc at (781) 222-3182 for mold remediation services that you can depend on.